How Accidental Transport Is Random? ArticlesHow Accidental Transport Is Random? The holidays are over and it's time to go to Sofia. Of course, everyone wants to travel at that time, and I buy a ticket at the last minute. After I went to the bus station, it turned out that there were no vacancies. To my luck, I accidentally met a boy who will travel the same day as me and will be able to drive me. What does occasional shipping mean? Random carriage is when the same vehicle is used to transport a predetermined group without changing the passengers. Typically, the trip begins and ends at the same place, for example if we are on a tour with a tour operator and leave from Sofia to Rome and we will go back. 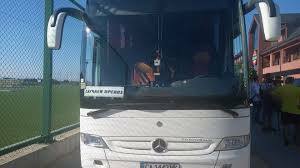 But the shipment may be "full - empty", meaning the group leaves one place, ends the journey to another and the bus has to go empty - if the trip to Rome does not involve returning to Sofia. There is also an empty-to-full shipment where the vehicle carries a journey from one point to another without passengers but on return with passengers. Can anyone carry out occasional transport? First of all, occasional passenger transport can be carried out by individuals and individuals and companies that hold a license and other documents required by law. The vehicle must have been pre-inspected for roadworthiness testing. NB! If children and / or students are traveling on the bus, a certificate will be issued for an additional inspection to check the equipment of the buses. What are the rules if I transport passengers with occasional services? I have to notify in writing, by post, mail, e-mail or fax, the relevant regional unit of the Automobile Administration Executive Agency in the area from which the shipment will start. I must send the notification at least one hour before the shipment starts. NB! If I transport children or students, I must have at least 2 years of professional experience as a bus driver and be at least 25 years old. I can only transport children or students during the day. If I violate this requirement, I can be fined 1000 levs, and the penalty for the tour operator company that hired me starts at BGN 10,000. I also have to make passenger insurance "Passenger Accident". Most often it is included in the price of the trip. Is there a difference between occasional carriage and own-account transport? What is the occasional shipment I have already understood, but what is the transportation for my own account I can learn in the following rows. Own-account transport is the transport of non-commercial or non-profit-making persons solely for own business or self-employed. The transport must be with own or hire (without driver) road vehicle and the driver must be employed under the contract of employment with the transport company. In addition, transport should not be a core business for the company. For example, I can use such a carriage if I have a big company and I ship the workers from home to work. As the head of the company I prepare a schedule for the work of the drivers who carry out the transport of the employees. How Accidental Transport Is Random? How Accidental Transport Is Random?